Oxígeno hiperbárico: su aplicación y resultados en implantología oral. singular importancia la llegada del oxígeno suficiente a la herida para que se disparen los mecanismos de cicatrización. La aplicación del Oxígeno Hiperbárico logra con creces concentraciones de dicho elemento en la zona injuriada, obteniendo resultados sorprendentes en la cicatrización principalmente de aquellos tejidos crónicamente afectados en su irrigación sanguínea. Doctor en Odontología, Universidad de la República. Chen X., Matsui Y., Ohno K., Michi K. (1999). Histomorphometric evaluation of the efect of hyperbaric oxygen treatment on healing around hydroxyapatite implants in irradiated rat bone. Int. J. Oral Maxillofacial Implants; 14(1): 61-68.
osteogenesis in irradiated rabbit mandibles with adjunctive hyperbaric oxygen therapy. J. Oral Maxillofacial Surgery; 64(4): 589-593. Coulthard P., Esposito M., Worthington H. V., Jokstad A. (2002). Therapeutic use of hyperbaric oxygen for irradiated dental implant patients: a systematic review. J. of Dental Education; 67(1): 64-68. Desola Jordi, (1998). Bases y fundamento terapéutico de la oxigenoterapia hiperbárica. JANO, medicina vol. LIV, nº 1260.
malignancies treated with radiotherapy and surgery without adjunctive hyperbaric oxygen. Int. J. Oral Maxillofacial Implants; 10(2): 183-187. Gill A.L., Bell C.N.A. (2004). Hyperbaric oxygen: its uses, mechanisms of action and outcomes. Q.J.M. ; 97(7): 385-395. Granström G. (2005). Osseointagration in irradiated cancer patients: an analysis with respect to implant failures. J. Oral Maxillofacial Surgery; 63(5): 579-585. Jisander S., Grenthe B., Alberius P. (1997). Dental implant survival in the irradiated jaw: a preliminary report. Int. J. Oral Maxillofacial Implants; 12(5): 643-648. Keller E.E. (1997). Placement of dental implants in the irradiated mandible: a protocol without adjunctive hyperbaric oxygen. J. Oral Maxillofacial Surgery; 55(9): 972-979.
hyperbaric oxygen. J. Oral Maxillofacial Surgery; 55(9): 967-971. Muhonen A., Muhonen J., Lindholm T.C., Minn H., Klossner J., Kulmala J., Happonen R.P. (2002). Osteodistraction of a previously irradiated mandible with or without adjunctive hyperbaric oxygenation: An experimental study in rabbits. Int. J. Oral Maxillofacial Surgery; 31(5): 519-524.
effects of irradiation and hyperbaric oxygen on bone formation during rabitt mandibular distraction. Arch Oral Biol. ; 47 (10): 701-707. Niimi A., Ueda M., Keller E.E., Worthington P. (1998). Experience with osseointegrated implants placed in irradiated tissues in Japan and the United States. Int. J. Oral Maxillofacial Implants; 13(3): 407-411.
bone induced by recombinant human bone morphogenetic protein-2. .Br. J. Oral Maxillofacial Surgery; 39(2): 91-95. Sawai T., Niimi A., Takahashi H., Ueda M. (1996). Histologic study of the effect of hyperbaric oxygen therapy on autogenous free bone grafts. J. Oral Maxillofacial Surgery; 54(8): 975-981. Dahlin C., Schenk R.K. Hong Kong: Quintessence Publishing Co. Inc. p.49-97. Spector M. (1999). Basic principles of tissue engineering. Tissue engineering. Lynch S.E., Genco R.J., Marx R.E. China: Quintessence Publishing Co. Inc. p. 3-14.
irradiated oral tissues: transmucosal oxygen tension measurements. J. Oral Maxillofacial Surgery; 55(10): 1103-1107. Ueda M., Kaneda T., Takahashi H. (1993). Effects of hyperbaric oxygen therapy on osseointegration of titanium implants in irradiated bone: a preliminary report. Int. J. Oral Maxillofacial Implants; 8(1): 41-44. Wood G.A., Liggins S.J. (1996). Does hyperbaric oxygen have a role in the management of osteoradionecrosis?. British Journal of Oral and Maxillofacial Surgery; 34(5): 424-427. HERNÁNDEZ, Alejandro. 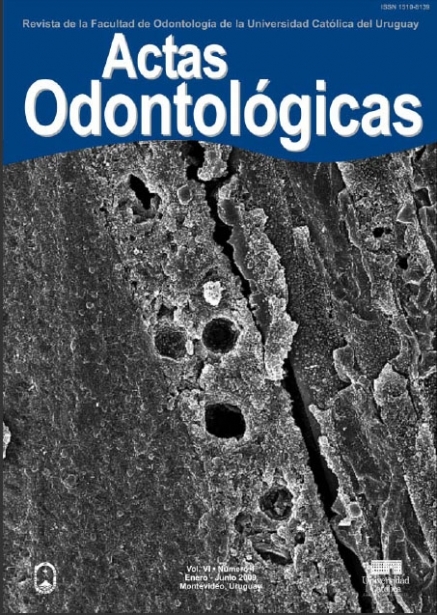 Oxígeno hiperbárico: su aplicación y resultados en implantología oral.. Actas Odontológicas (Publicación discontinuada), [S.l. ], v. 6, n. 1, p. 28-43, apr. 2016. ISSN 2393-6304. Disponible en: <http://revistas.ucu.edu.uy/index.php/actasodontologicas/article/view/1086>. Fecha de acceso: 23 apr. 2019 doi: https://doi.org/10.22235/ao.v6i1.1086.